This little Ugly Christmas Vest is a real cutie. 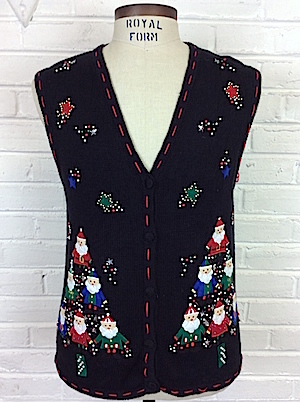 On each side of the vest are groups of six little guys who are either gnomes, elves or tiny Santas in red, green or blue, and they're stacked on each other like a cheerleading pyramid formation. Beads of gold, pearl, red and green are scattered around the little guys and also surround the fuzzy felt stars above them, some of which are silver and confetti-like. One gnome/Santa on the upper back with beads. Collar, sleeves and hem are ribbed with red thread accents. Five black Cloth buttons. Tag reads Bobbie Brooks. Ramie/Cotton. Condition: Good. Missing one button. Also has a few loose threads and and a few missing beads. Priced Accordingly.